A man by the name of Edward Smyth is selling items out of his UK apartment under the name E.S. Photographics. He has been selling on ebay with the username e_s_photographics and claims to have been rebottling FilmGuard, however when I spoke to him regarding a cease and desist he did not take anything I asked seriously and was boasting about how he knew the ingredients. It is unknown if he has truly been rebottling or if he hasn’t just been partially rebottling FilmGuard and mixing in other fillers, or if he has just been filling his mini bottles with his own concoction. Based upon his boasting of knowing the ingredients, of which nobody does other than the patent attorney and the inventor (which is myself), there are real good odds he wasn’t simply rebottling. Eddie Smyth’s supplier was cut off earlier this year and the way he failed to take anything I said seriously (even his lack of understanding on how a certain type of plastic bottle is needed for the cleaning liquid) there are HIGH ODDS you are not getting real, uncontaminated FilmGuard. He has since changed the product name to FilmShield and changed up a few words in his ebay description blatantly trying to pass this off as FilmGuard to people who don’t look closely. (Same fonts, etc.) He also is trying to block the US from seeing his listings, as he knows what he is doing is unethical and illegal. This sort of thing has happened before. One party claimed they were simply rebottling and another literally created their own mixture and sold it AS “FilmGuard”. The first party failed to understand the chemistry (which is protected by patent) and was sending out contaminated bottles which had an unexpected delayed reaction time of around a year before film damage started to occur. The second party wasn’t even smart enough to fake the physical appearance of the solution, and their mixture took about 3-4 weeks to turn the film into one big roll of glue, like a hockey puck! Again I stress, in BOTH cases film damage occurred! So here we are with a THIRD imposter, trying to make a quick buck from unsuspecting film collectors. If you have purchased from this guy, BUYER BEWARE! Odds are you do NOT have real and uncontaminated FilmGuard and are likely putting your films at risk. So everyone is fully aware, FilmGuard has NEVER been sold in any size container other than a 32oz bottle. Period. I realize for some collectors that is a lifetime supply and we are researching producing some 16oz bottles on the batch currently in production, but as of today, any bottle of FilmGuard (or something claiming to be FilmGuard) that is not in a 32oz bottle with our standard packaging with an intact tamper seal on the box is not a legit product. Where can the official original FilmGuard in its 32oz bottle still be purchased then within the UK Brad? In more recent times, I have only ever purchased mine from cinemasupplies. They now show "in stock" apparently, but with a purchase price of £0.00?? Does this mean they still officially sell it and if not, who does here? I have previously had dealings with this man and he is rude and arrogant and will not take criticism of any kind even if it is positive. He markets a lot of different cine related items and I would recommend that anyone thinking of making any purchase from him to be very careful. I personally avoid his site like the plague. Thanks for exposing the truth about this; it's outrageous to try and sell dubious goods by misleadingly associating them with a reputable product. Brad - I happen to have a small bottle of rebottled genuine Film Guard that wasn't sold; it was given to me by a Forum member a few years ago so that I could try it. Are you saying that it would be unwise to use this, due to possible deterioration caused by the rebottling? Andrew, I'm not sure who "cinemasupplies" is. Do you have a website link? Adrian, based upon talking with Eddie, I sure as heck wouldn't risk it if it was my film. Cinemasupplies is Jack Roe (CS) Ltd (Jackro) here in the UK. I took it that that this company was an official authorized dealer of your product here in the UK as this has been a long standing dealer of your official product here in the UK historically. I telephoned them yesterday again after the recent events revealed here to see what availability of the official original product they had if any given the way the website was advertising the product as "in Stock" but unusually for them, without any kind of price against the product. I was informed by their staff that the product is currently out of stock after an unexpected "rush" on FilmGuard and that when it is back in stock soon, it will have basically almost doubled overnight in price! Is this something you are aware of Brad as an owner / supplier of your product presumably? Also it is appreciated that you have highlighted where NOT to buy the product here in the UK due to issues surrounding it's authenticity or possible contamination problems from decanting but what would then be helpful is if you could list a number of legitimate authorized dealers here and throughout Europe so that we know where WE CAN purchase your excellent product from at a standard and competitive price point. I look forward to hearing back from you Brad regarding all of these points raised here. This is alarming news! I too would appreciate the details of a UK supplier who had authentic status. I have bought lamps and belts from ES Photographics and was considering the 'Film Guard' but now I definitely WON'T be buying from him again. I support him being told to stop what he is doing immediately because this is real shyster activity. Pleased to hear your decision not to use him. Let's hope this thread can gather momentum so that all members boycott this seller and spread the message to all cine enthusiasts. Jack Roe is listed as the authorised supplier for Europe on the Film-Tech website. There's a link to the product on the Amazon US website but Film-Tech do not ship to the UK. 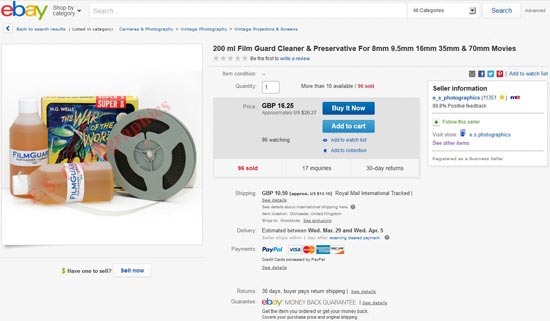 This thread is not only of high interest for UK members but also for those based in other European countries (like Belgium) where there is no official re-sellers of Filmguard. I buy my bottles from Paul Foster. Paul no longer stocks it Dominique as far as I know. So who does ship the product to Europe Will? Someone must be importing it from Brad here in the U.S. as we in the UK have been able to find it for sale here for years. I found another film cleaner advertised by another maker and they can only ship to mainland USA and not overseas due to postal regulations. Have there been changes? Must FilmGuard now be sent by sea which might explain the price hike Andrew mentioned? A certain person by the name of Brad Miller is spreading lies throughout the film collecting community regarding my sales of Filmguard. Brad (the developer of this solution) is accusing me of passing off a possible fake product which is not the case at all. Shame on you Brad for doing this and shame on any user of the 8mm forum for adding their comments without having a clue what started all this. It only proves how people are quick to judge before they know the facts. What about my say? Well, for those interested, here is my say and I might add, the simple unadulterated truth. I have been a collector for many years and I have a lot of enthusiasm, especially when it comes to preparing my adverts for selling film related items. I try to go the extra mile and on this occasion, I sincerely wish I hadn’t bothered. It began in February 2016 when I purchased 2 bottles of Filmguard from Jacro (Cinema Supplies) to resell on ebay. The bottles which were designed for cinema use are a large 32fl oz size (just short of a litre) and realistically way too big for the average 8mm collector. To make matters worse, the weight alone would make shipping costs oversees prohibitive. After only selling 1 full sized bottle, I came up with the idea of dividing the contents into handy sized 200ml bottles. This meant that a customer could buy a smaller amount and not have to pay extremely high postage charges. I ordered 100 perfectly suitable bottles, printed labels and included literature exactly as was included with the original large purchased bottles. The bottles began to sell and everyone was happy (or so it seemed). I received an email from Mr Miller basically saying that I was not allowed to do this because for all he knew, I could be selling another product under the Filmguard name. I not only informed him that I purchased his product legitimately from the UK importers (Jacro) but in order to prove it, I sent him every invoice (as are also included here just so that you can form your own opinion). My point to Brad and more importantly, to you the reader, is this. 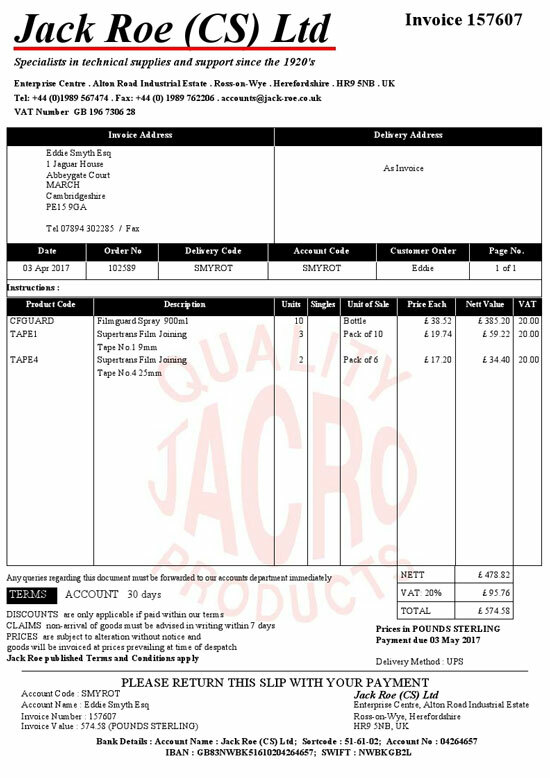 Why would anyone spend £2,810.50 during the course of 13 months on Filmguard from such a well-known establishment as Jacro (whom I have dealt with for 30 years during my time in the cinema industry) if HE were wanting to sell an inferior mixture? I mean come on people . . . use the brains that God blessed you with PLEASE! I put it to Brad that I was actually doing him a favour and if anything he should be praising me for being innovative. I backed this up by adding that anyone would realise that his sales of Filmguard surely must have taken a fall since the advent of digital cinema. He agreed it had but followed with the statement that he considered sales from Filmguard as merely being “small change” compared with his other outlets. He reiterated that Filmguard is not available in any other size than the 32fl oz bottle and that I am not an authorised reseller. I said fine then, make me an authorised reseller of smaller bottles. The answer? You guessed it. I firmly believe that when a person accuses someone and that someone shows evidence that they have in actual fact not done anything illegal, the accuser gets a bee in his bonnet. The original issue then takes a back seat and it’s now a matter of not backing down, whatever the accused comes up with to the contrary. The bottles used are High-Density Polyethylene (HDPE) and in case anyone is concerned about their safety, here is a few of it’s other uses. I think we can rest assured that Filmguard will sit in them just fine. Mr Miller then contacted Jacro and made it clear that they refuse to sell me anymore Filmguard otherwise he would not be supplying them with anymore in the future. As I know the sales team really well, they felt quite put out that they had to take this action. I spoke with one of their senior members and told him not to worry and that I knew their hands were tied. We naturally still remain good friends. The problem I now had was that I was left with lots of bottles of Filmguard to resell. I certainly wasn’t going to embarrass myself or Jacro by asking if I could get a refund, so I decided to change the name to Filmshield until I had emptied my supplies. I did this for one reason only, to at least prevent any further accusations of being associated with the Filmguard name. So yes then, I have to admit that I have done one thing wrong and I deserve hanging for my crimes. I put Filmguard into smaller bottles so that people with smaller film collections could buy it. Is that such a terrible thing? You decide! But before you do, let’s look at the massive profit I made. As anyone with a mind capable of making an informed decision can see from the above, the only person benefitting here was indeed Mr. Miller but yet he chose to destroy it. Have I lost out? Do you really think that I will miss £1.83 profit per bottle after having laid out hundreds of pounds for it to sit on the shelf? No, the only persons losing out here are the people who found it convenient to buy a smaller cheaper bottle of Filmguard. So, before you judge, before you add your little lynch mob style comments on any forum I suggest you get your facts straight. And to the persons who state they will never buy from me again, then do just that because your custom is certainly not wanted. Here are the invoices for the Filmguard I purchased (apparently I can't upload more than one but the other 8 are available upon request). You know how to contact Jacro if you need to validate ANY SMALL DETAIL of this or in fact my integrity. Finally, I hold my hands up to the mistake of re-bottling, but don’t ever let me hear anyone accusing me of such things as selling fake items, especially if I am in the same room as you!!! Edward,...re-packing any copyryighted/licensed/patented products is illegal in any case, although you buy it legitemately. You have to get a signed consent letter from the patent holders in doing this. You bought (legally) a box of assorted biscuits under Arnott's brand. Found out people only love to eat waffer and raisin biscuits. You CANNOT buy that assorted biscuits box and re-pack only for waffer or raisin alone, although it is under Arnott's brand, nor change under a new name. It is simply, you CANNOT. I think consent may be the word you were looking for Winbert, not concern. Hi Brad please consider that Eddie is, for a fair bit of effort offering a handy, and practical way for people in the UK to buy this great Product. Many people can`t afford the large outlay on a large bottle over here. We are the poor relations to the USA after all. Our cost of living here is going crackers. I think the smaller bottle`s are very handy for us so please consider supporting Eddie in this. Its great for the hobby to have filmguard available like this over here as there is nothing to touch it these days for how good and also how low toxic wise it is too. I`ve had a few dealings with Eddie over the filmie years, all very possitive and polite times allround. He offers very good support and help in the hobby. Thanks Eddie. And thanks Brad too for filmguard. Yes Jack Roe UK is currently the only authorized dealer. If you have received FilmGuard direct from them (which would have come in the official packaging), then it is the real stuff. If it has gone through anyone else, and ESPECIALLY if it isn't in our factory packaging, buyer beware...someone is trying to pull something over on you. The amazon store is direct from us, but unfortunately we have not yet come up with a good means to export to the UK, Australia, etc. Amazon does not make things easy (and they charge an insane fee, causing the price to really be jacked up). This is why we have simply been referring people to Jack Roe, as they have always been a solid and quality company. FilmGuard is still the only film cleaner out there that is not hazardous materials. Yes it can ship by air. The price hike is due to the fact that we used to manufacture the product by the truckload. Pallets and pallets of it would ship out every week back in the days when commercial cinemas were using it regularly. When the industry switched to digital cinema the demand, as would be expected, dropped dramatically. When we then ran out and had to make another batch to continue supplying it, we found that to make it in a radically smaller quantity along with price hikes on the chemicals themselves, the sheer cost of manufacturing it was crazy more than in the past...hence the cost increase. Jack Roe's previous order was honored at old pricing regardless and apparently they had a goof in their system such that it didn't get noted, but their current order is at the new pricing (and it is literally in transit to them now). I cannot help the price. It just costs more to manufacture now than in years past when chemicals were cheaper and we were producing in mega-quantities. It should be noted the profit line from FilmGuard represents a mere fraction of a single percent of my company's yearly business. I only continue to make it for all of the archives and film collectors around the world that want it. Our business these days is primarily digital cinema. We are at a point to where we will be out of stock for a few weeks to a month, but after that there won't be any expected backorders. Jack Roe UK will have stock by next week though. First, you are not welcome here. I am leaving your post above, but will not permit you to participate on this forum ever again. Consider yourself banned permanently for the way you are handling this situation and your blatant disregard for the integrity of a product I worked very hard for many years on and hold a pioneer patent for. Do not try and have friends post on your behalf and do not try and register with a fake name. It will not be tolerated. I gave Eddie every chance possible to fix this problem. He continues to this day his criminal activity. I firmly believe two things. #1 I believe Eddie did buy various bottles of FilmGuard from Jack Roe. It is obvious from his blatant attempt to fool film collectors into buying the FilmShield bottles alone that he is not an honest man of character. He refused to cease and desist, and is now going to try and go down the pity/drama road with the various collectors. I warned him the first thing I would do is to out his practices publicly and even gave him a few months...but guess what is STILL online right now for sale on ebay? You guessed it, FilmShield! As I explained to you I would rather take FilmGuard completely off the market than have yet another scam artist selling a knock-off product and destroy the name. Also regular HDPE plastic bottles doesn't work. To help explain the point in a more obvious manner, ziploc baggies and wax cups work for holding lots of stuff too, but that doesn't make it suitable for FilmGuard! You don't know what is in FilmGuard, nor do you know how various plastics affect the chemical composition over time. You are simply doing this to try and make a quick buck...period. don’t ever let me hear anyone accusing me of such things as selling fake items, especially if I am in the same room as you!!! Mr. Smyth, please DO let me know if you will ever be in the US. I will happily meet you in the same room so you can take your threat of violence out on me. That childish threat of violence further goes to show what kind of person you are. The last two posts by Winbert and Andrew sum it up well. You simply cannot do what you are doing. It is not only illegal from a re-packaging without consent standpoint, it is a violation of patent laws as well as trademark laws. I will say it one last time because I know you will read this: Cease and desist immediately. At this point if the FilmShield auctions continue, everyone on this forum will know without a doubt Eddie is not running a professional operation. As of the time of this posting, he is STILL continuing to sell this knock-off. In no way will the decision to NOT permit anyone to re-bottle FilmGuard change based upon your post or anyone else's. I understand a smaller bottle is desired and as I stated previously we are working on that for this next batch, so such a thing will likely be available within a few months. However if you want to see Eddie prosper, help get it through his head this will only get much worse for him if he continues to sell this knock-off product. There's a six pack of Cola cans in our kitchen. Each can is endorsed "Multipack can not to be sold separately" which seems to back up Winbert's comment. The key word, as Andrew posted, is "consent". Hi Brad, I just checked, and the last time I heard from Eddie was in January via email. I actually forgot to get back at the time !!! age etc. Not actually spoken to him in person ( about some belts I think ) for about 2 years or thereabouts and might be longer. Thanks for the thorough explanation regarding the recent price increase Brad. Also it appears here in the UK Jack Roe is the only official outlet now for anyone seeking the original product so again, thanks for clarification on that too. I feel the smaller 16 oz bottle of FilmGuard will actually be most welcomed here in the UK and given the expense of the full sized bottle to many small gauge collectors here, may prove even more popular than the original sized bottle over time. Anyhow, I appreciate the feedback from everyone involved and of course especially Brad here and I am just pleased now at least, that we all know where things stand regarding this marvellous product. A couple of you have mentioned that film collectors in Blighty would appreciate a smaller bottle of FilmGuard made available, but I'm sure our cousins across The Pond would would value it just as much. I moved back from California last year and I can tell you that the cost of living in the big cities in the USA is easily on a par with with here. The only thing out of this that concerns me is the reference to the plastic bottles, if the plastic can contaminate the film guard after a period of time then some sort of reaction is occurring, what will it do to film based on these findings? Or have I got this wrong? Mark. All I could add to that Mark,is after 10 to 15 years of acetate and polyester films that i have treated with FG either by myself or previous owners, absolutely nothing untoward so far would be my answer. In a few examples i believe this stretches to 20 years by now. I think Mark is referring to the bottles used by Eddie when he decants from the original Filmguard 32oz container. Obviously Brad is using a container that does not react or effect the contents otherwise the film industry would have made representations about film damage by now. I agree with some earlier comments. Now that the outlet for the product from the cinema trade seems to have almost dried up, perhaps Brad might now consider using smaller bottles.